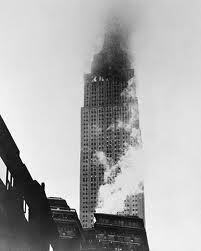 On July 28, 1945, a U.S. Army bomber crashed into the 79th floor of New York’s Empire State Building, killing 14 people. 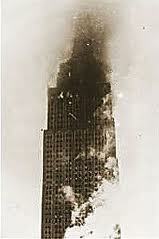 The crash not only damaged the Empire State Building (estimates at the time ran from $500,000 to $1 million in damages): one of the plane’s engines actually shot through the building, tore a hole in the south side, and plummeted down onto the penthouse of 10 West 33rd Street, the studio of sculptor Henry Hering. The subsequent fire destroyed the studio. The other engine went into the elevator shaft, snapping the cable and driving the car — with two women in it — down to the basement; both women survived, one with severe burns. The plane was captained by decorated pilot Col. William F. Smith, Jr. Just a few minutes earlier, Smith had radioed La Guardia airport; what happened next is unclear. According to some published reports, air traffic control told Smith to land in Queens; but there is also evidence that Smith was cleared to land in Newark as long as he could maintain three miles visibility. It is certain that Smith’s visibility quickly worsened. With the fog growing thicker, Smith decided to fly lower to check his visibility; when he emerged from the clouds he found himself in Midtown Manhattan and somehow managed to fly about ten blocks, dodging skyscrapers, before ultimately hitting the Empire State. More about the Empire State Building — and the aircraft originally designed to land on its towering spire — can be found in Inside the Apple: A Streetwise History of New York City.